As you readers may or may not know, last week was national pollinators week. Unfortunately, the week was kickstarted by a horribly mass murder – namely, the loss of 50,000 bumble bees and assorted other pollinators. An Oregon Target parking lot was littered with corpses after thoughtless landscapers sprayed trees in bloom with toxic pesticides. This is a pretty serious blow to an already struggling group of flying insects. As a gardener and someone who is concerned about her own food security, I am deeply troubled by the apparent disregard for the lives of these tiny foodies. I experienced low yields of tomatoes and squash last year as a result of, I think, diminished pollinator populations, and already this year I have watched my tomato plants flower only to see that several days later those same flowers have died and fallen with no fruit. It’s pretty terrifying, to be honest. All this work going into growing food plants only to have nothing happen because there are no bees. BUT, if we’re being completely honest here, I was also kind of afraid of chickens. With the flapping and the pecking and the crazy dinosaur eyes. I totally conquered that fear, so bees should be easy, right!? They’re so much smaller than chickens after all. And you get honey! Eventually…in theory. In either case, I have some bee keeper friends who I will speak to about it and I am really thinking of just diving right in. Food security is reliant on our pollinators and small hives with access to organic and non-toxic food sources (such as those found in my garden!) 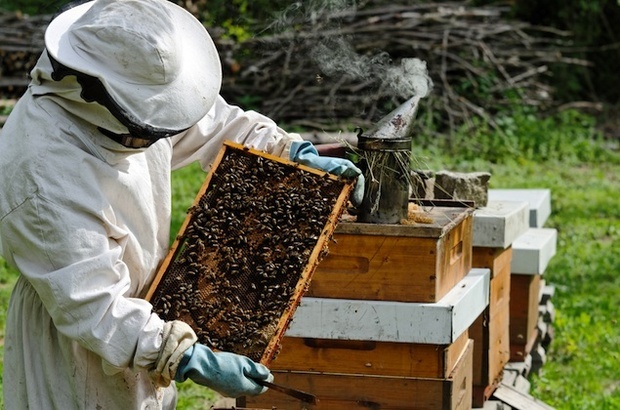 are the best way, in my humble opinion, to stabilize the bee population. The first step in my journey I think will be to read up on beekeeping techniques and philosophies. I will share any reviews about books and how-to guides that I come across. In the meantime, Happy Eating! The biggest concern with this years bird, aside from politics, is of course the best way to cook a Heritage Turkey. I have never attempted it myself and I have heard such widely contradictory theories as to the best way to go about it. Some folks swear by brining it and then roasting at high heat until it reaches temperature. 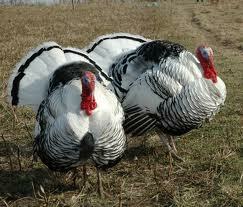 I have no desire to brine a turkey for a variety of reasons. First, I don’t have a place to keep a turkey in brine for two days, unless you count the garage and frankly, that doesn’t sound very hygienic. Second, I want to try roasting it without the fool-proof guarantee of a brine. The other option of course is to smother it in butter, which frankly sounds better than soaking it in salt anyway. In fact one of the most interesting recipes I’ve seen involves using maple butter under the skin. A version is found here at the Heritage Foods USA web site. I like this idea as I think the maple flavor would really enhance the (supposedly) richer flavor of the heritage bird. I then plan on stuffing it with apples, carrots and a few sprigs of rosemary. I am hopeful that it will turn out well, and fully intend on taking photos and posting about the results. In addition to the turkey I also will be rendering some lard for the pie crusts and roasting and pureeing the pumpkins from our garden. For the pecan pie I am going to try a recipe using brown rice syrup instead of corn syrup and the stash of locally grown pecans I have been saving. Also on the menu is some fresh baked bread, a sausage and bread stuffing, the potatoes from our garden, and a host of veggies. Unfortunately I will not be making the green bean casserole this year due to the fact that all of the green beans we processed and froze were ruined when my three year old turned off the chest freezer….alas, we had to say goodbye to 20 lbs of green beans, several whole chickens and some frozen apples. It was quite sad. I hope that all of you are gearing up for the holiday with as much enthusiasm as I am! I just need to figure out a way to include some goat milk and some eggs in our feast in order to make it pretty much totally home grown! Happy Eating! There are some interesting things going on in food this week! While at the dentists office waiting for my son’s father to get out from under the drill, I saw a full page ad in one of the magazines for Eco-Grain bread. Having recently read this article from the Cornucopia Institute about Sara Lee’s attempts to hoodwink the consumer, I was fascinated by the fact-less marketing speak utilized in the full page ad. Phrases like “better than organic” and “sustainable” are sprinkled throughout the full page ad, luring the consumer in. Not only is the bread full of chemical additives and highly processed foods, but the whole idea of trade-marking a phrase like Eco-Grain just grates on my nerves. I simply don’t understand how food can be deemed intellectual property. A second example of corporate participation in the overall movement toward better food involves mega-corporation Walmart. A recent article at Grist.org discussed whether or not Walmart was the future of local food, and it appears that there is a large push to increase their organic lines. Additionally, Walmart is touting this article found in The Atlantic as evidence that the corporation is saving people from food deserts. We shall see…having visited my local Walmart recently in order to pick up a post dental surgery prescription, I have to say I am not impressed. Perhaps it is my inherent cynicism or maybe it is just my local store, but if I am going to spend $6.00 on a gallon of organic milk, I want my money going to someone other than a multi-national conglomerate known for their poor employee treatment, low wages and general icki-ness. On that note, lets talk about some GMO’s! There seems to be some evidence that Monsanto falsified research (shocker!) and might even have concerns for the safety of it’s product – namely a second generation GM corn crop. For more information and a discussion on the details, check out this article. And lastly, a somewhat more positive piece of news. The Farm-to-Consumer Legal Defense Fund has decided to support Raw Milk enthusiasts by taking on the FDA’s refusal to budge on laws against bringing raw milk across state lines. Check out the article and the author’s blog about raw milk. Hopefully all of this will give you something to ruminate on for the week! Until next time, Happy Eating! 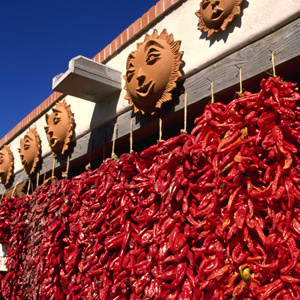 This week there are some great things going on locally including a heritage meat tasting event hosted by Slow Food Santa Fe and taking place at the Santa Fe Farmer’s Market pavilion. Additionally the New Mexico Organic Farming Conference is taking place this weekend. All growers, sellers and buyers are encouraged to attend! Concerning large scale operations there was also some news this week. I don’t usually watch mainstream media, but this last week CBS highlighted the dangers of routine antibiotic use in animals. Unfortunately the woman representing the pork board is clearly on the payroll of the drug companies. And the farmers are concerned only about profit. It is an eye opening interview, although I’m not sure anyone involved realizes the message they are really conveying. Additionally, the USDA released new organic dairy regulations. While most seem to be pretty happy that there are stricter rules, some organic dairy’s, including Strauss Farms, were not pleased. For all of you New Mexico readers, the state senate has passed the food tax bill, although no one is sure if it will pass house approval. The main reason I am following this story is because the tax, apparently, applies only to things like candy, soda, processed foods and, strangely enough, white flour tortillas. Any food that is considered applicable to WIC (the federal Women, Infant’s and Children program) will not be taxed. This includes things like milk, eggs and vegetables – although it also includes peanut butter. We will see if it goes through, but I find it at least a little heartening to learn that the state of NM is trying to encourage its citizens to eat better, even if it means taxing the bad stuff. The only real concern, of course, is the tortilla tax. New Mexican’s eat a lot of tortillas. Check this article out for more info on the two sides of the debate. There is something inspiring about community. This week Santa Fe was host to the inaugural Edible Institute – a gathering of food writers and activists from across the country who came together for discussions on a variety of issues. Topics included how to educate the public about SOLE food (Sustainable, Organic, Local, Ethical) without sounding preachy, specific ethical issues affecting food politics, and of course a panel discussion on the Southwestern Foodshed. Perhaps the conversation most relevant to this blog was the panel discussion on the Southwestern Food Shed. The discussion was focused primarily on seed sovereignty and the work people have put into legislation here in the state that will protect farmer’s rights as concerns their ability to not only save their seeds, but also to be safe from biotech lawsuits in the event that GE crops cross-pollinate through no fault of the farmers. I was fortunate enough to be able to ask a question of the panel about the GE chile mentioned in this post. Unfortunately I failed to get an answer as to whether or not the chile was in production, but I did get a long history of the chile. Apparently the research is being conduced at NMSU, located in Albuquerque, and began in 2005. Additionally, it appears as though while originally New Mexico was breaking ground in seed sovereignty and farmer protection, this is no longer the case. A Seed Sovereignty Declaration was originally written here in New Mexico and has since been signed by not only all the major Native tribes, but also by International groups. Unfortunately the state that launched this movement is now watering down the original language thanks primarily to a million dollar donation by the biotech company in favor of continuing research on the GE chile. Additional information on the Seed Sovereignty declaration as well as up to date information on the status of the legislation in question can be found here at the New Mexico Acequia Association web site. I highly recommend all readers in the state of New Mexico read the information contained on this site and, if inspired, contact your representative to express your concerns over GE crops, especially the chile. And while this conversation was most relevant to me given its local flavor, the other thing of extreme interest to me was a discussion on the rights, or lack thereof, of farm workers. Particularly those workers who may be illegal immigrants and who are working for large commodity growers. There is a lot of discussion about how disenfranchised small and medium farmers are in the current economic situation, but the rights of the workers are frequently overlooked. In fact, there have been 7 cases of farm worker mistreatment that have been successfully prosecuted under this country’s slavery laws! The most famous of which involved workers actually being chained to farm equipment. The conversation was specifically focused on the Imokalee Tomato Workers and their struggle for rights. More information can be found on their web site here. All in all, the experience was fabulous and I really enjoyed participating. These kinds of community events are so important – to share information, connect with others and generally feel as though the momentum of the SOLE movement is going strong. This post has been my contribution to Food Renegade’s Fight Back Fridays blog carnival. Check it out for more Real Food info! My local Co-op publishes a monthly news letter that is chock full of information on local food issues. Everything from information on state legislation to updates on the successes of local products. This month, one of the more disturbing themes was about genetically engineered crops and the lawsuits brought against individual farmers by GE giant Monsanto.The most upsetting part of this article, however, was the disclosure that the NM state legislature has been funding the development of a genetically engineered chile since 2006. New Mexico is a huge chile producer (anyone who has seen Hatch green chile in their supermarket is buying from a town named Hatch in the southern part of the state – at least in theory), and apparently this research is being done on behalf on the NM Chile Association, web site here. Why is unclear and merits more research. Of course, the NM GE chile no doubt does not contain the roundup readiness of Monsanto’s famous grains, and an argument could be made that the act of creating hybrids is crucial to the evolution of agriculture – domestication of wild wheat, etc. However it still makes me nervous, and rightfully so. In either case, it has certainly inclined me to do more research on the topic. I dislike the idea of a group such as Native Seeds SEARCH going to all the trouble of saving heirloom and historical varieties of chile just to have the state of NM undermine their own agricultural heritage by actively funding a GE crop. 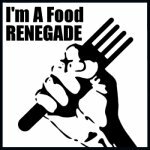 This post has been my contribution to Food Renegade’s Fight Back Friday‘s blog carnival. It has been a while since I have read a book that makes me laugh out loud, but this one by Barbara Kingsolver has caused me to laugh hysterically, alarming my family more than once. The book is basically a memoir, retelling the tale of a year spent by Kingsolver and her family sustaining themselves with home grown food. It starts off with the whole family uprooting themselves from a Tucson home and moving east, to 40 acres in Appalachia. They then proceed to do all the work required to feed a family of four with their own bare hands, including raising poultry for slaughter. Kingsolver relays these tales with a self-depricating sense of humor and a realism that makes not only the book imminently relatable, but also inspires a sense of confidence in the reader. It makes me think that I too could grow all my own vegetables and bake all of my own bread. Perhaps I felt this way while reading because I am already moving in that direction – owning dairy goats, learning to garden, planting fruit trees and contemplating buying my own chickens this spring, but I like to think that it has as much to do with the authors sense of ease and her willingness to share her own failures and successes. The book also contains brief additions written by Kingsolver’s husband and eldest daughter which include information on legislation, food trends and recipes. Each chapter in the book contains one or more of these short essays and I feel the communal nature of the writing helps engage the reader and makes one feel included in the project set forth at the beginning of the book – a year of self-subsistence. All in all I feel that this book is a fabulous introduction to the ideas and realities of eating local, sustainable food. A much better introduction to the lifestyle and the philosophy than something like “Omnivore’s Dilemma” by Pollan, mostly because it presents the ideas of Slow Food in a day to day, down home manner, rather than as a terrifying look into the horrors of food production in the country. 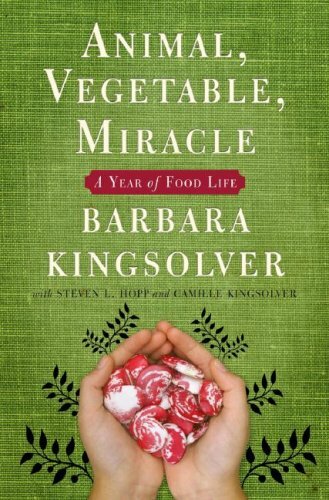 As Kingsolver’s own daughter relates in the book, people tend to dislike being preached to and when she tried to share her new found knowledge about industrial farms, people often resented being made to feel guilty about their food choices. For this reason alone I believe that “Animal, Vegetable, Miracle” is a great book to recommend to those people who may be curious about changing their food habits, but need a gentle introduction to the lifestyle and the benefits of SOLE food. This post is my contribution to Food Renegade’s Fight Back Friday blog carnival.